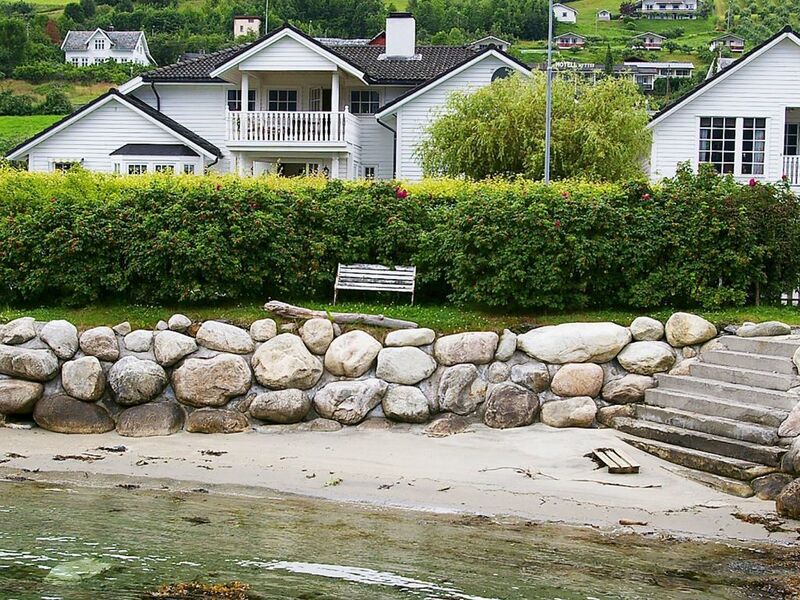 This magnificent holiday apartment sits right by the fjord in Leikanger municipality. From the apartment on the second floor of a garage, you have a fantastic view of Sognefjorden. The house has a sheltered and covered balcony with walls on both sides. A small road goes between the house and the fjord, but with little traffic. This is a quiet and beautiful residential area. At your disposal is an idyllic yard that goes all the way down to a private, sandy beach with a dock, rowing boat, outdoors fireplace/grill and gazebo, where you can enjoy the scenic view in all kinds of weather. You can also rent a 25 hp outboard motor and borrow diving equipment and water skis. The single bedroom can be made into a double. Baby cot can be requested. The apartment was renovated in 2012, and all furniture and equipment is from this year. Either if you are sitting at the dining table, in the living room or on the balcony, you have a stunning panoramic view of the fjord. Leikanger is sunny with a mild climate. Here you can find fruit trees that usually does not grow this far north, like peach, apricot and walnut. If you visit at the right time, you can taste peach and fruit from the hostess' garden. In May, 80 000 fruit trees are in full bloom, an impressive sight. In September, plums, pears and apples are ripe. Leikanger is centrally located for all attractions by Sognefjorden. The express boat wharf is only a 5 minute walk from the house. Travel with the boat for day excursions to Flåm, Bergen or for island hopping by the coast.